Nested right on the edge of the Tennesse river, the Chattanooga Aquarium is a hallmark for the "Scenic City". The riverfront property gives some clue to what differentiates the aquarium from others of its kind. While most public aquariums rely on showy shark tanks or oddball ocean creatures to draw in crowds, the Chattanooga aquarium invests most of its quality into its freshwater systems. This is a real risk, considering that most people are more familiar with freshwater, and so are less likely to go to an aquarium to look at trout. However, in this case, it pays off. Their facilities are the best freshwater display I have personally ever seen. That doesn't mean their saltwater isn't a sight to behold as well though. IN fact, the emphasize both, they split the aquarium into two separate buildings, one fresh, one salty. I wanted to cover the saltwater facilities first, since they are more similar to other aquariums. Both the fresh and saltwater buildings are laid out similar to the National Aquarium in Baltimore, where guests ride an escalator up to the top of the Aquarium and then work their way down through the different exhibits. For the saltwater exhibits, which are also the predominantly tropical ones, this starts with a large touch-pool and botanical gardens under the glass roof. This upper layer also includes a butterfly garden. All in all this is a one stop shop for tropical paradise, with fun touchable fish and colorful plants and insects abounding. Diving deeper into the aquarium, the sun disappears and the blue of aquariums fills it with underwater glow. The main attraction is a large artificial reef tank with sea-turtles, sharks, and schools of many types of reef fish. This tank actually comes into view from different perspectives when walking through the levels. At the top it is an open view of the upper coral layer and surface, while later on guests walk down the slope and find the bottom layer, even walking through the coral structure that was seen from above before. This multi-layer experience is very interesting, and provides lots of perspectives on the tank. There are other smaller exhibits on the side, and even a penguin exhibit in the same building, which is very fun. It's almost like a treasure hunt, except you don't need to worry about being lost. A note for the purists out there as well. Even though their main display was synthetic coral, they did have a tank with more corals in it later on, which showed some very good growth and diversity. the real star of the show is the freshwater building. It starts at the top with a personal first: an indoor temperate forest. 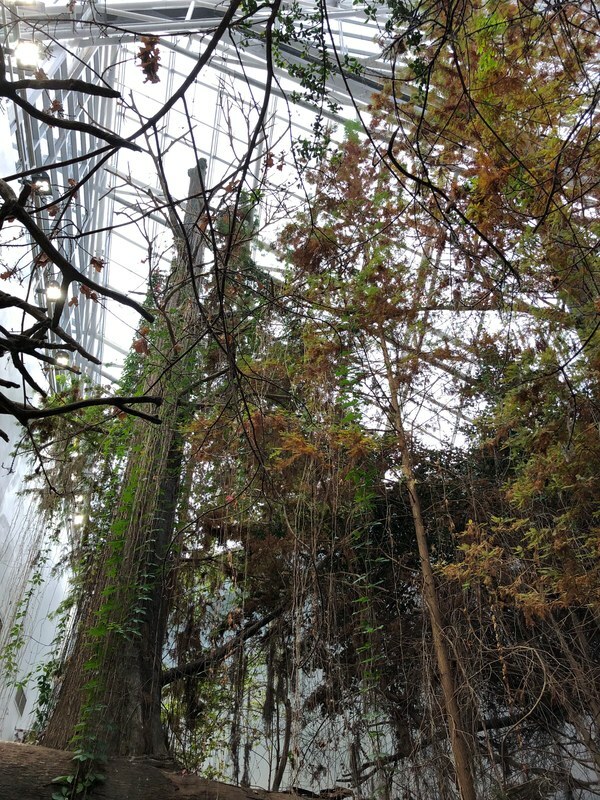 We visited while it was cold, and the trees inside the building were losing leaves. Granted it was slightly chilly, but the effect of indoors seasons was pretty spectacular. They also had river otters on the top level, which make a great welcoming committee. Working down, there is a multistory vertical room, with pathways crisscrossing through it and running around the edge. This is where the largest tanks were, with the large tropical freshwater tank as well as the two story river tank with trout in it. on the adjacent rooms lie a plethora of exhibits, from a freshwater swamp with alligators and turtles to some very species specific exhibits, like a sturgeon touch tank and an entire room dedicated to turtles and tortoises. There was also a strong focus on local species, and conservation in this building. There were a number of endangered turtles, fish, and some amphibians that the aquarium let you know were being bred for conservation. There were even visible breeding tanks for an endangered species of minnow that was being reintroduced to streams as part of the conservation the aquarium does. Considering this is usually a behind the scenes thing that aquariums do, the education and inspiration power at this location was really special. After a late night of travel, everyone was a little bit wary waking up to go the the conference on Friday. However, the display waiting for us on the main floor quickly dispelled any tired dispositions. The room spanned a football field, filled entirely with amazing aquarium products, niche celebrities, and beautiful tanks. The companies really wanted to wow the attendees, and they spared no expense. Right in the second I walked up to, there were about 20 captive bred angel fish, each of which could have have easily sold for $4000. 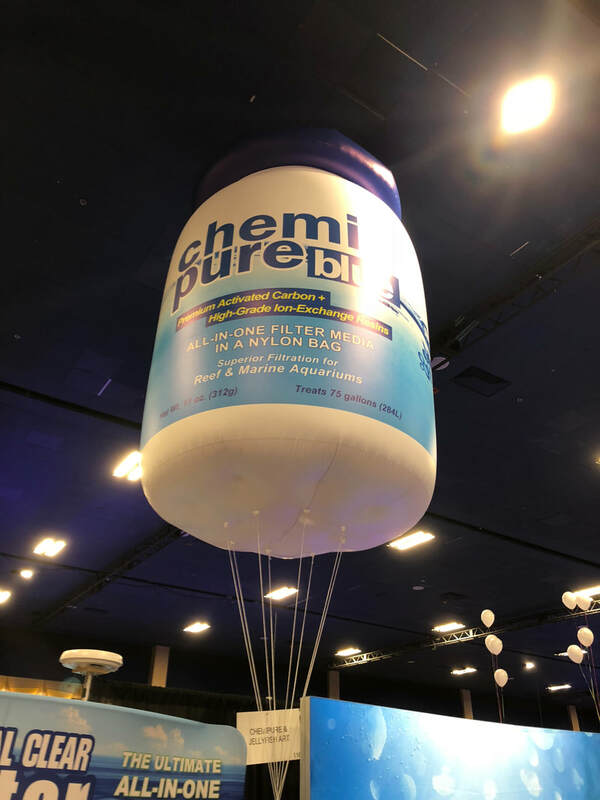 There were coral frag stands, hundreds of clown fish(sometimes in a single tank), coral apparel, tanks with water running down the exterior, and a giant Chemipure balloon overlooking the whole hall. Some of our members even had their photo taken with the stars of Tanked, pretty much the only fish tank celebs to ever go mainstream. The whole thing blew me out of the water to be sure. Besides the spectacle being put on on in the main floor, there were also more informative discussions going on in the adjacent rooms. There were well known speakers in the aquarium community(including a local friend of the club, Julian Sprung) as well as meet ups and workshops for particular interests. I personally attended a presentation on the history of marine fish breeding, which was interesting, and although not practically applicable, it did provide an overview of names and companies to keep an eye on. Most members didn't take advantage of these events, and decided to spend more time on the floor, but having the opportunity was very nice. There were also students and researchers presenting research about topics related to the aquarium hobby, and it was very rewarding to talk to them about their study. One of them was even a UMAC alum, shout out to Mike Connelly). After walking 3 miles from the hotel, it is easy to imagine how happy we were to finally arrive at the (air conditioned) Cancun Aquarium. From the outside it is a very unassuming location, the aquarium itself is situated inside a larger shopping and tourist complex. There was a small entrance, and four kiosks on the outside with a salesman trying to up-sell us on an "experience". Even first walking into the aquarium it was quite modest, with a number of small tanks to welcome you into the dim space, lit only by the cylinders of water around you. Unlike the giant, Georgia aquarium with an entrance large enough to service an amusement park, and its huge central space that you first walk into. This one was much less busy, and a more relaxing, reserved experience. Walking further through the aquarium we entered the outdoor portion of the aquarium. Here there was a very large stingray tank along with a touch tank. The real centerpiece though was the dolphin tank, which was below the boardwalk we were walking on. It consisted of two deep pools connected by a shallow bridge, and we sat and watched the people who had payed for the dolphin interaction play with the dolphins while a number of clearly well trained staff guided and instructed. It was also on this boardwalk that one of our members decided to get a fish spa, where some doctor fish (G. rufa) ate the dead skin off his feet. the final portion of the aquarium was a two story tall tank holding some betrays, and various Caribbean species. There was also a tank with an adorable yellow blackspot pufferfish. Although smaller than many of the aquariums we visited, this aquarium featured a number of interesting and unique exhibits, with lots of educational and interactive tools. Even though we decided not to pay extra for add ons, there were still some games, touch tanks, and ways that this aquarium engaged and educated. Also despite its small size it featured a few local and endangered species (with a large statue of a vaquita, a critically endangered porpoise), like the pejelagarto, a local gar species. The National Aquarium in Baltimore was originally opened August 8th, 1981 and has since expanded to become one of the top U.S. aquariums. As a large Baltimore attraction, the aquarium draws approximately 1.5 million visitors annually. This facility holds more than 17,000 animals across more than 750 species. This collection is housed in approximately 2.2 million gallons throughout the aquarium. There are 12 notable exhibits throughout the aquarium and they are detailed below. Containing both land and water dwelling creatures, the Amazon River Forest exhibit features fish such as discus, silver arowana, and white-blotched river stingrays. Giant South American river turtles roam the waters of the exhibits as well, and perched above, you’re likely to see giant waxy tree frogs or an emerald tree boa. The dual exhibits show stages of the Amazon tributary both during the rainy season and the dry season. This 335,000 gallon, 13 foot deep exhibit features more than 500 fish. As you descend through the exhibit you might be lucky enough to see the exhibit being fed by a diver, an occurrence which happens several times throughout the day. This unique exhibit shows the differences between Atlantic and Pacific environments with both Atlantic sea cliffs to a lush kelp forest, to a vibrant Pacific reef. If you’re an avid birder you might be interested to see the only black guillemots on display in the United States. This exhibit features a northern Australian river gorge. This look into Australia allows visitors to walk through the bottom of the mock gorge and get close to 1,800 native animals across 120 different species. Some of these unique animals occur natively only in Australia. The Blacktip Reef exhibit is an award-winning exhibit that recreates an Indo-Pacific reef. This exhibit is full of coral and allows visitors to see some great marine organisms from unique vantage points. This exhibit is the largest exhibit in the aquarium and was first opened in 1990 and features eight Atlantic bottlenose dolphins. Guests can visit the exhibit to learn more about how dolphins learn, play, and interact with each other. Marine mammal experts are present to answer any questions one might have about these unique animals. Guests can also partake in Keeper Talks to hear a formal presentation about the exhibit. Jellyfish live across the globe in every ocean, thrive in coastal and open waters, and live even in freshwater environments. This exhibit features nine different jelly species and is sure to be an eye catching exhibit. The living seashore exhibit features touch tanks and a variety of other hands-on experiences. In this unique exhibit visitors can explore all aspects of the seashore including approximately 150 animals. Visitors can learn more about the seashore as well as conservation efforts to protect these unique areas. Four exhibits give visitors the Maryland experience through habitats ranging from an Allegheny stream, to a tidal marsh and coastal beach, to the continental shelf. This circular 225,000 gallon exhibit features a number of different sharks as well as some other fish of the sea. This exhibit features several different tanks showing a diverse range of species all with important adaptations suited for survival. Some of the notable species include a giant Pacific octopus which can change color and electric eels which generate electricity. This aquarium contains more than just some aquatic companions as shown in the Tropical Rain Forest exhibit. While walking through this exhibit, it would be worth looking up as well as around as some of the animals might be perched high above. This past weekend (4/22 - 4/24) UMAC took our Spring semester trip up to Toronto, our second international trip and first trip to Canada! We met up Friday morning and stumbled across Rho Rho Rho at the metro on their way to the airport for their trip to Chicago. We managed to immerse ourselves among the local Canadians shortly after landing with Tim Hortons and poutine. Saturday we woke up early to walk downtown to Ripley's Aquarium of Canada. Groups split up the following day to walk around Toronto visiting both the University of Toronto as well as the Royal Ontario Museum. We arrived bright and early for the 9:00 am opening time at Ripley's Aquarium of Canada and were met with Earth Day events. Face painting, a mascot, and much more were only slightly out shined by the impressive combined freshwater and saltwater aquarium build in the main entrance. The first exhibit showed local freshwater species in a large wall sized tank. Delving further into the building, arguably one of the most interesting animals was found, a Giant Pacific Octopus. Moving around the tank, it was followed wherever it went by exited members. Moving further, down a ramp around circular tank the height of several floors, members peered into a tank replicating a kelp forest. Eventually we stumbled upon the main attraction, the moving walkway encircled on both sides by a huge tank holding all variety of animals including a sea turtle, sawfish, and a variety of sharks. Some members had fun crawling through an interactive exhibit which featured no less than four species of sharks. A large central area contained a number of interactive elements which appeared to provide great educational opportunities for both younger visitors and older as well. 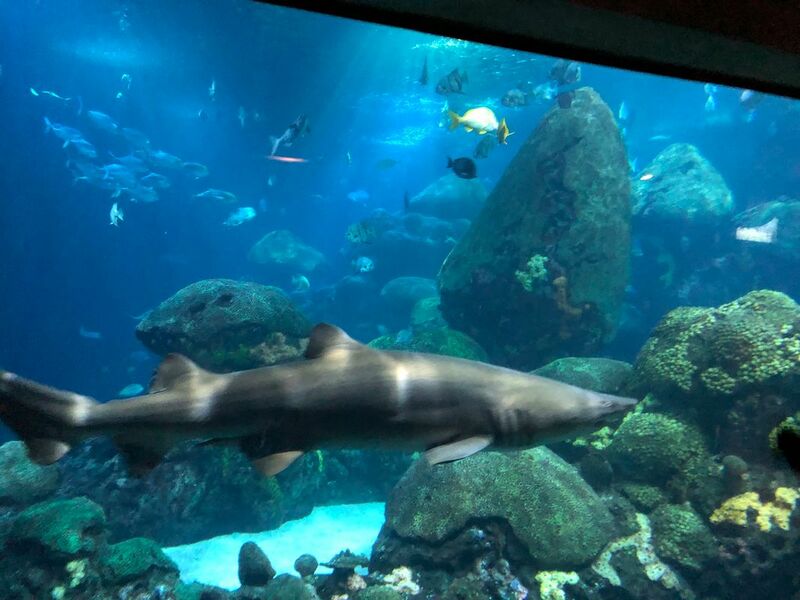 Following notable exhibits included a number of jellyfish tanks, a behind the scenes look at how the aquarium's tanks are run, and a large exhibit containing southern stingrays, cownose rays, and bonnethead sharks. Members enjoyed an educational talk about the exhibit as well as watched a feeding of some of the southern stingrays. On the way out the group was presented with great views over both the ray tank and the larger tank that members had previously walked under. Moon Jellyfish (Aurelia aurita) are a classic staple at public aquariums, famous for their rhythmic pulsation while floating through the water column of large, cylindrical tanks. 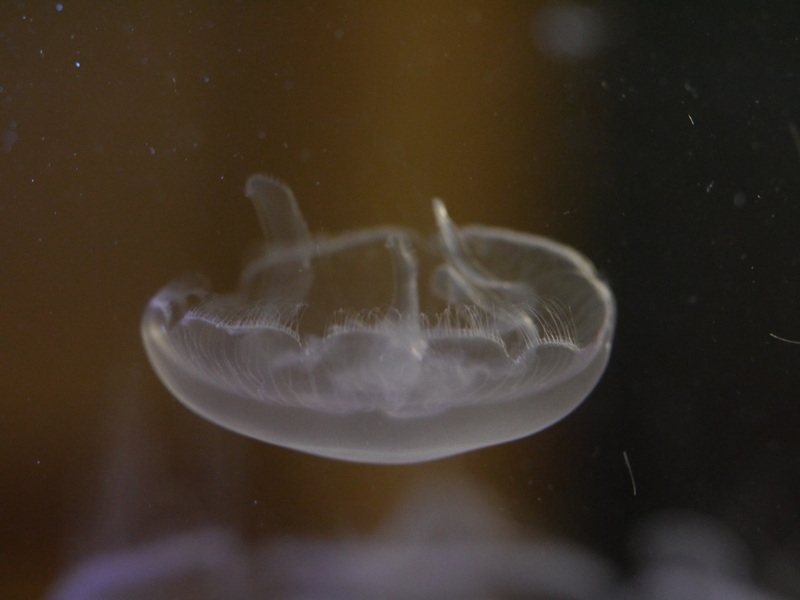 While Moon Jellies are relatively basic in their demands from a captive aquarium system, the average hobbyist typically struggles to keep them alive. This isn't due to a lack of proper nutrition or water quality, but simply because the standard aquarium is rectangular, resulting in lots of jellies crammed into tight corners or completely destroyed after going through a filter or powerhead. Enter Jellyfish Art, a Florida-based company that is bringing the ridiculously simple joy of keeping Moon Jellies to thousands of hobbyists each year. Jellyfish Art manufactures specially designed cylindrical aquariums (called kreisels, German for "carousel") without obstructions that keep Moon Jellies suspended in the water column continuously. 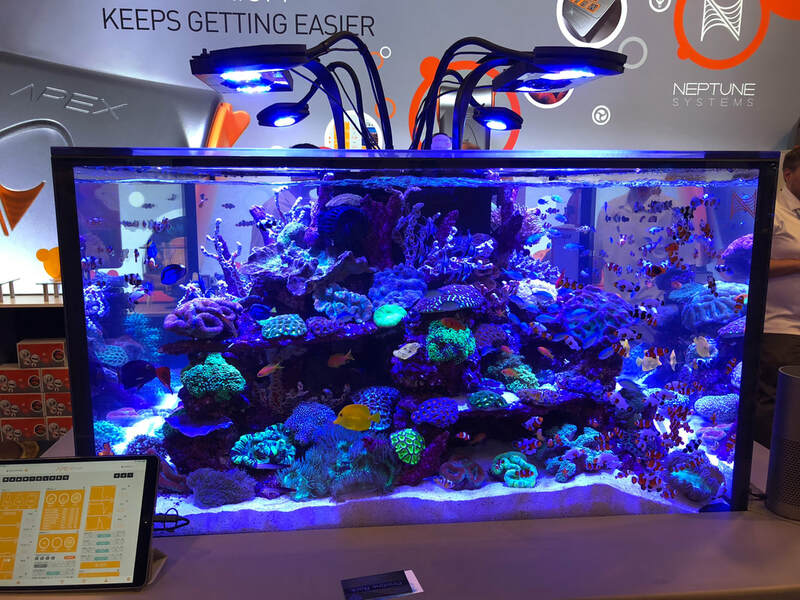 Usually kreisel tanks are only seen in public aquariums, research laboratories, or in the homes of very advanced hobbyists, but Jellyfish Art's endeavors now make owning an aesthetic display kreisel easier than ever. Eager to learn more about their unique design and what it takes to successfully maintain and reproduce Moon Jellies, UMAC invited Jellyfish Art to come speak at a meeting this fall. Last week, Jellyfish Art came through with an excellent presentation on Moon Jelly life cycles and captive care, plus a few awesome surprises at the end! Standard Moon Jellyfish. Typical lifespan is 1 year. Several of Jellyfish Art's staff drove down to the Coral Gables campus last Thursday (10/23), and UMAC President Kyle David welcomed them to our meeting specially located in Cox 145 for their presentation. After introductions, Joe Turner launched into a detailed presentation that explained the various life stages of Moon Jellies, followed by some photos demonstrating how Jellyfish Art propagates the Moon Jellies that go into the unique display aquariums they manufacture. Briefly, Moon Jellies undergo a period of both sexual and asexual reproduction during their life cycles, as well as stages in which they are both medusa and polyp forms. Sexual reproduction and fertilization of gametes released by adult Moon Jellyfish results in a planula, which seeks substrate where it attaches and grows into a polyp stage. This polyp stage will grow and divide asexually for a period of up to several months to even years! Eventually, a series of environmental cues (salinity, temperature, photoperiod changes) will induce strobilation from the polyp stage, in which dozens of ephyra are released after having been stacked on top of one another. These ephyra grow and mature into adult Moon Jellies by feeding on plankton, and restart the cycle all over again through sexual reproduction. It's a relatively complex life cycle for such a simple organism! 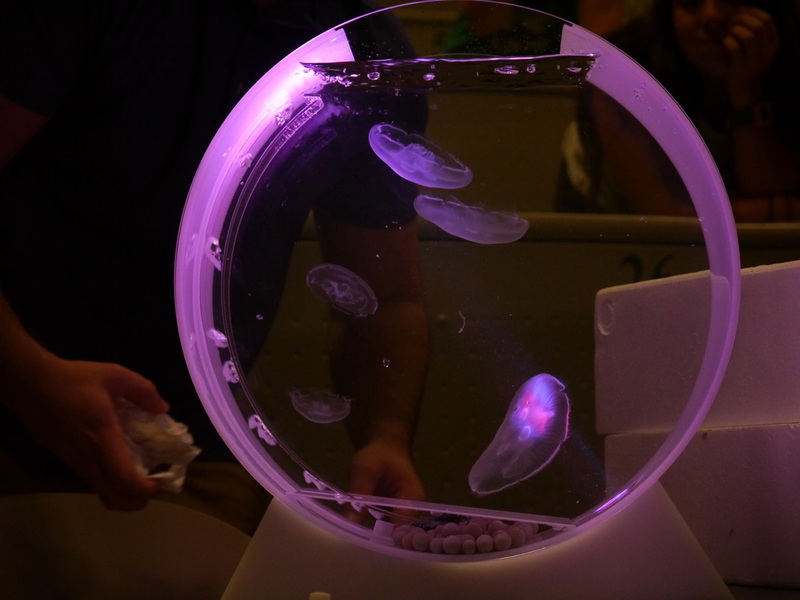 Joe Turner demonstrating the remarkable simplicity of Jellyfish Art's kreisel aquariums. Moon Jellies are very delicate, and therefore only need a minimal air-driven current to remain suspended in the center of the tank. A rigorous Q&A session followed Joe's in-depth lecture, in which UMAC members probed behind-the-scenes of Jellyfish Art to learn more about what new concepts are on the way from this revolutionary company. We learned about the details of Jellyfish Art's experimentation with Sea Nettle propagation, and also received a great book recommendation for anyone interested in advanced jellyfish propagation (How to Keep Jellyfish in Aquariums: An Introductory Guide by Chad L. Widmer). But the greatest surprise was yet to come! At the conclusion of the meeting, Jellyfish Art donated one of their 6-gallon desktop kreisels to UMAC, completely opening the door to future experimentation and jellyfish care for club members. The system is now up and running on the second floor of the Ungar Building in the Marine Science Offices. UMAC is extremely indebted to Jellyfish Art for their willingness to support our organization. A special thanks goes to all of the staff of Jellyfish Art who came to campus and gave their time to educate club members in this unforgettable meeting. Don't forget to go check out Jellyfish Art's official website: jellyfishart.com and stay tuned for more UMAC happenings this semester, 'cause we're not even closed to finished yet! P.S. The kreisel design aquariums that Jellyfish Art produces are kind of a big deal. Their cylindrical shape and gentle flow makes these tanks ideal for keeping all sorts of marine pelagic species, not just Moon Jellyfish. The fact that these systems are now available on a hobby-wide scale is more than impressive, it's potentially revolutionary. This past weekend (10/15 - 10/18) UMAC boarded a plane from Ft. Lauderdale and traveled to the Windy City for the first time! After arriving and dispersing to various locations Wednesday evening, members regrouped Thursday morning and headed for the Field Museum on South Chicago's Museum Campus before visiting the nearby Shedd Aquarium on Friday. The Field Museum is beyond massive. One could not hope to experience even a fraction of the Field's wealth of knowledge in a single day, especially when you consider the vaults of artifacts stored off display in the museum's basements. UMAC members were extremely fortunate to be given a tour of the Field's extensive collections, with a focus on Birds, Invertebrates, and Fishes. To convey an understanding of the Field's various collections, pictures and details are given below! Chicago's Shedd Aquarium might have the most unique architecture and location combination of any public aquarium in the United States. 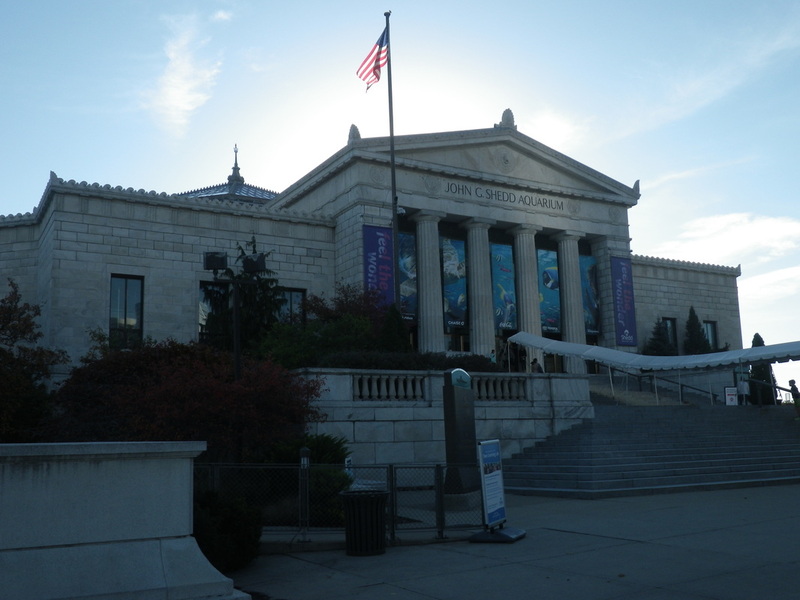 The Shedd is just south of downtown Chicago on Lake Michigan's shore, and resembles a large bank or government office more than a state-of-the-art aquarium. Even so, the Shedd Aquarium is one of if not the most biodiverse public aquariums in the USA, and you can tell as soon as you enter the front doors. Exhibits at the Shedd housed a mesmerizing array of aquatic and terrestrial organisms. From dozens of Lake Tanganyika African Cichlid species to a Merten's Water Monitor to deepwater Ratfishes to Pacific White-sided Dolphins... you get the point. The exhibits at the Shedd stunned not by being overly massive or possessing one or more "Holy S___!" animals (see Georgia Aquarium), but rather by showcasing a mind-boggling variety of organisms cared for at a very high level. It's a hefty task to break down even a small selection of the highlight reel from such an expansive aquarium, but as always, UMAC is up to the challenge! 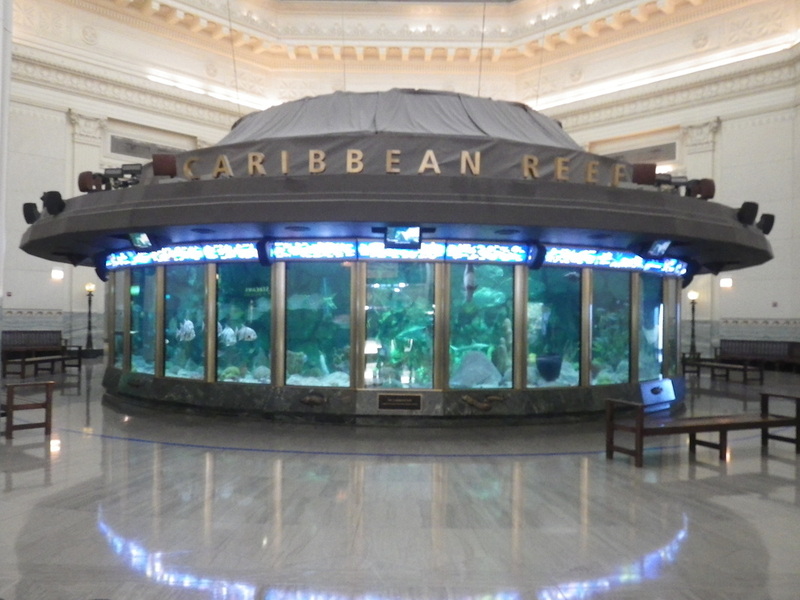 Caribbean Reef is the first aquarium visible upon entry to the Shedd, and due to the club's familiarity with tropical Atlantic fishes, the exhibit had to set a high bar for the rest of the aquarium. Of all the Caribbean reef fish aquariums I have ever beheld, the Shedd's version clearly contained the highest species diversity. Large Tarpon and Spadefishes share the cylindrical aquarium with many smaller reef fish, including Queen Angelfishes, Royal Grammas, and all four Atlantic Butterflyfishes in the genus Chaetodon. The surprise gems of Caribbean Reef would have to be the two Prognathodes Butterflies - the Longsnout and Bank Butterflyfish are both deeper water species and certainly command attention! The beauty of Caribbean Reef is due to the Shedd's great relationship with the Bahamas - a partnership that benefits both parties. Shedd researchers investigate topics of marine importance for the Bahamas, to better educate the government as it enacts environmental policy towards furthering ocean conservation. The Waters of the World exhibit at the Shedd Aquarium is one of the most ambitious exhibits for a public aquarium, as it attempts to recreate over a dozen natural biome habitats ranging from Southeast Asian rainforest streams to Australian Rivers and African Great Lakes. The range of animals displayed is incredible, including a Giant Pacific Octopus, Paddlefish(! ), and Mantella Frogs. Mantella Frogs are exceedingly rare poison dart frogs, and are bred at the Shedd in conservation efforts. To further illustrate the true breadth of healthy biological diversity maintained in the Shedd's exhibits, we learned in our behind-the-scenes tour that the plants in each of the tanks were fully alive and grew out of the water towards sunlights above! Again, the Shedd's location and ability to expand has played a major role in it's animal care, making the wealthy of diverse life truly impressive. Admittedly, I spent the least time in Amazon Rising. This doesn't mean it wasn't a fascinating exhibit, or that I couldn't have learned more about the seasonal rains in the Amazon River Basin, but it does speak volumes about the Shedd's depth as an aquarium. The jaw-dropping superstar of the Amazon was undoubtedly the Anaconda (Eunectes murinus) - massive, active, and suspended in the water allowing onlookers to stare it in the eye. Other tanks displayed heavily planted freshwater aquariums. The Abbott Oceanarium is home to most of the marine mammals at the Shedd Aquarium, including Beluga Whales, Pacific White-sided Dolphins, and California Sea Otters. Fun, and admittedly educational to see trainers interact for training and conditioning purposes with cetaceans! Also penguins were fun as well. Located in an underneath area of the Shedd, Wild Reef showcases the Shedd's living coral collection, as well as a now-expected high diversity of reef fishes in a range of habitats. High-profile fishes included a Venustus Angelfish, Green Sawfish, and a pair of Pink Skunk Clownfish with a fresh clutch of eggs! The Jellies exhibit at the Shedd is technically a temporary special exhibit, but has nonetheless been established for over half a decade. See the pictures below for some cool pics of the range of species they were able to care for! Very impressive and diverse, given that most were aquacultured on-site. P.S. We're not done yet! This past weekend was an absolute blast. 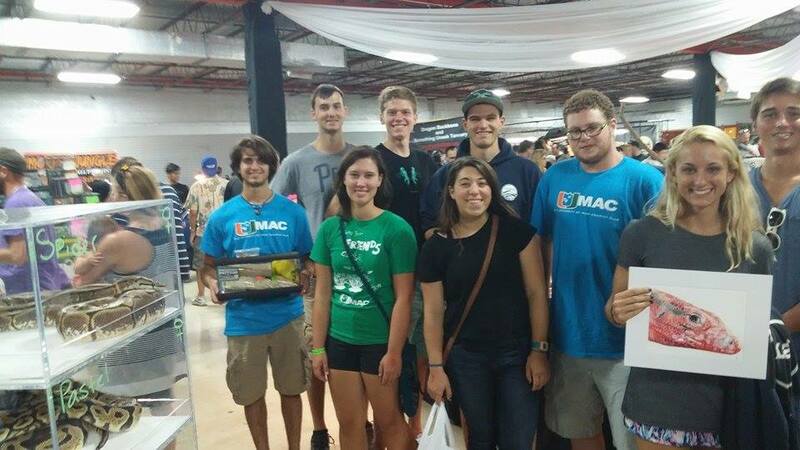 Saturday started off right, as a few UMAC members headed up to West Palm Beach to check out the semi-regular Repticon, a reptile trade show centered around various snakes, lizards, geckos, amphibians, and other oddities. Although not quite aquariums, I learned a lot at the convention center and even was coaxed into adding a new, reptilian member to my family! Check out my tangential post in the forum to learn more about her. Other UMAC members picked up some new pets on Saturday, and enjoyed socializing with some of the larger Ball Pythons on display! 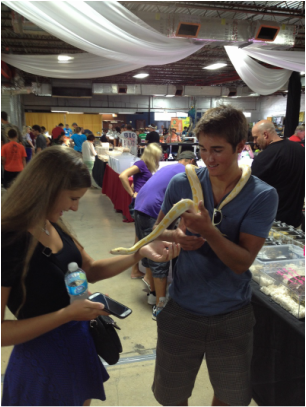 Repticon really was an awesome time, hopefully we have a chance to go again in the future! After Saturday evenings (mis-)adventures, we all gathered again Sunday morning and shipped out to Bill Baggs State Park on Key Biscayne for an afternoon of sun and fun. For the third time in two days we proved that UMAC knows how to get down! The water and waves were fantastic, and although we decided not to try seining, the sun was just right in order to help us relax for the coming school year. I've posted a few more photos in the slideshow below from both events. Stay tuned for more plans and our first official Fish Crawl going around to some local aquarium stores in the coming week! And it goes without saying that you better be at our Thursday meeting! First Meeting Fall 2014: Caribbean Reef Reveal! A new calendar year for UMAC began last night with the opening of our first meeting of Fall 2014. 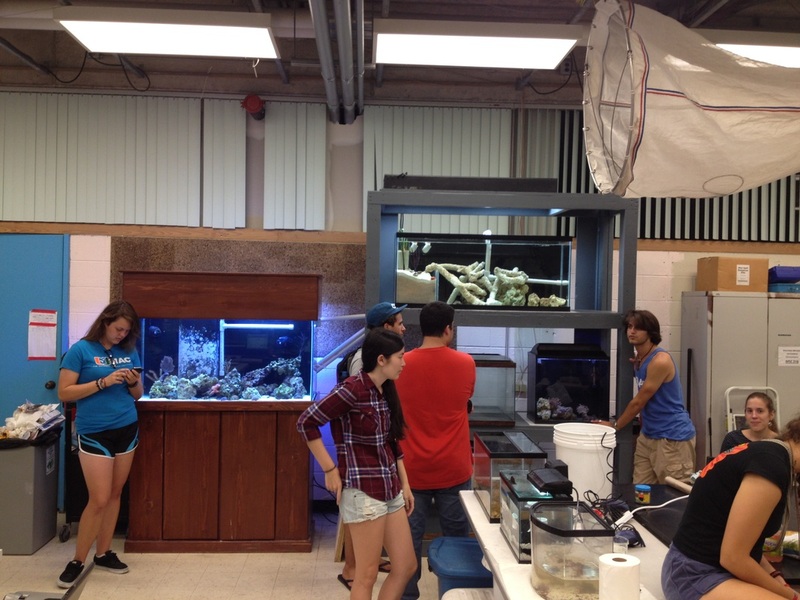 It was a pleasure to see all of the new students coming out to join the club, and was an even greater surprise to learn what a large proportion already were aquarists! I am looking forward to really getting to know all of our new members over the course of this semester, and can promise an engaging UMAC experience in the next few months. That said, it was great to reconnect with all of my friends from last year and the year before, and welcome you all back to Miami! 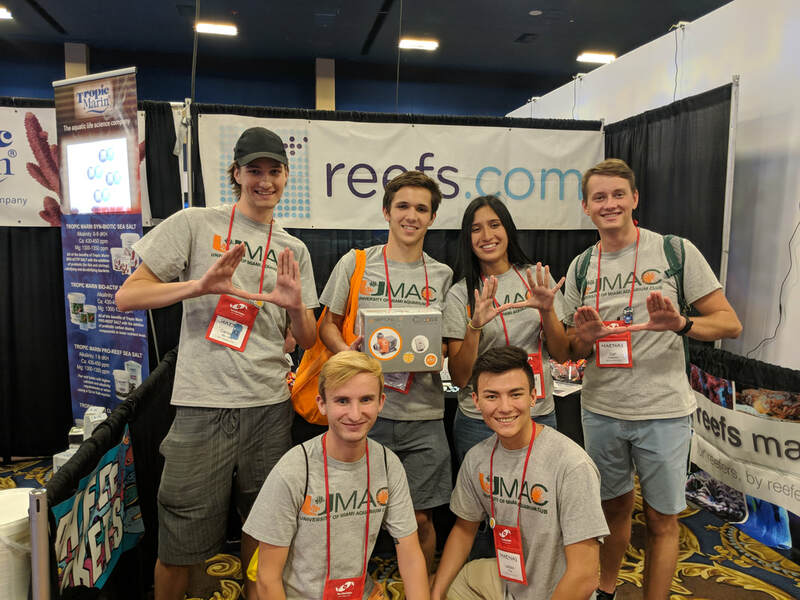 UMAC now officially has representation from all four classes at the University of Miami, which really speaks to the breadth and diversity of the club's members. President Kyle David opened up the meeting with an introduction to the club's 2014 officers, and then proceeded to formally announce our plans for field trips to the South Florida Science Center and the Shedd Aquarium in Chicago this semester. Also, this weekend marks the annual occurrence of the Repticon Convention in West Palm Beach on Saturday, 8/30. If you missed the sign-ups at the meeting and would like to join the club members driving up to take a gander at all the reptiles and amphibians on display, email the club at umaquariumclub@gmail.com to get in touch! The same can be said for anyone interested in coming along for UMAC's Sunday 8/31 Beach Day at Bill Baggs State Park on Key Biscayne. We'll be spending all day at the beach engaging in nautical hijinks and enjoying the sun and waves. Both trips leave from the Stanford Circle on Coral Gables campus at 10:00am. There are over a dozen species of Actinarians in the main reef, and already mangroves are in place in the deep sand bed portion of the refugium. After quarantine and disease monitoring, we hope to add some colorful South Florida fishes to the display midway through September. Our clownfish pair is also healthy, and the Zebra Mantis Shrimp remains a joy to behold. A meeting in full with UMAC's reef front and center! As the summer begins to turn towards the home stretch, the aquarium renovation underway in the Cox Science Center 184 is making strides to be completed just in time for the start of the semester! Now, we have finally acquired a major aquarium rack to hold our refugium, clownfishes, and possibly more tanks and dry gear! The rack was built this past weekend, and even now is being loaded with the prepared aquariums so that plumbing and electrical work can begin. Check out some pictures from the construction process in the slideshow below. 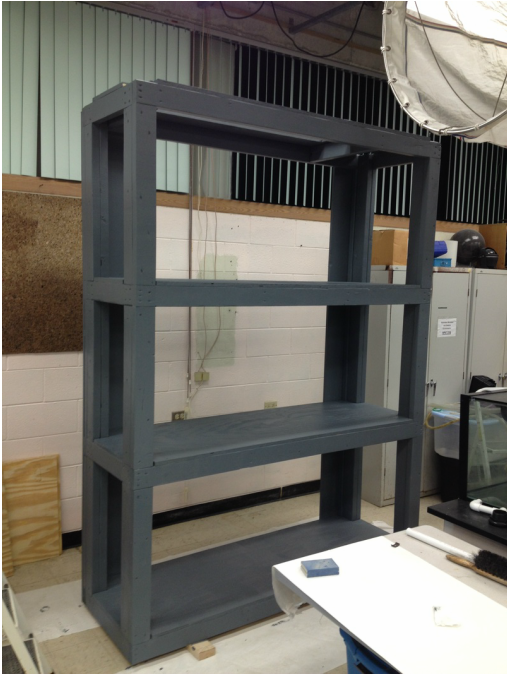 Major thanks go out to the three Mikes who helped out in building the rack: Mike P. Connelly, Mike T. Connelly, and Mike Simet. In closing, you should be excited about the aquariums that UMAC will be holding on to this year. 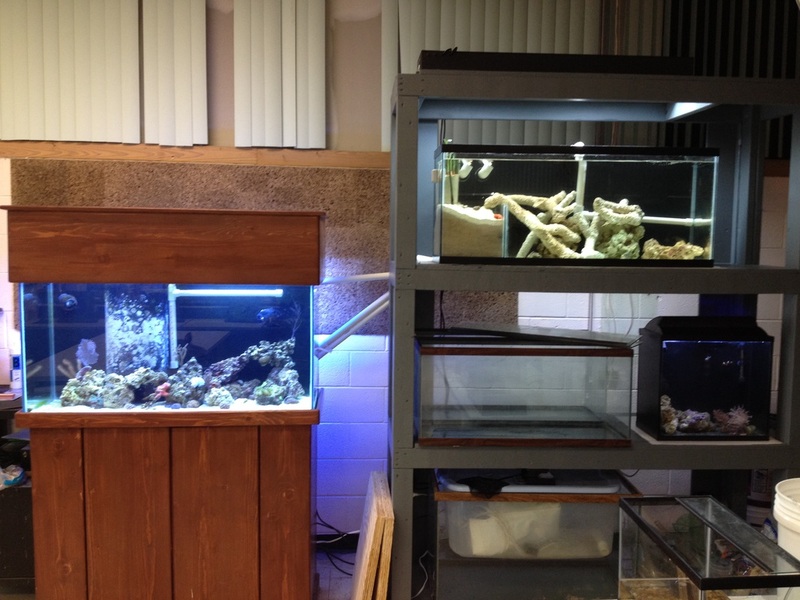 With the rack a whole new range of projects can be started, from breeding and live feeds setups to coral propagation. A new academic year is on the way! 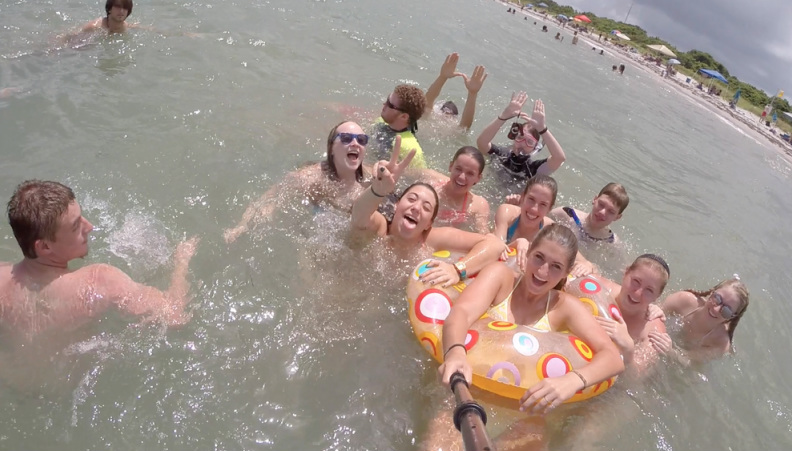 We are the University of Miami Aquarium Club. Blog topics will include anything and everything aquarium related.